Who Killed the Hippocratic Oath? 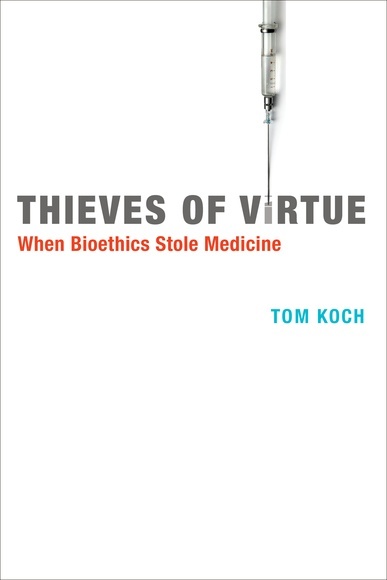 Thieves of Virtue: When Bioethics Stole Medecin, Tom Koch, The MIT Press, £20.95. Born in the 1960s, bioethics was to bring “a specific kind of analytic, moral philosophy to questions of medical care and healthcare delivery.” In this well researched book, Tom Koch explains why contemporary bioethics fails to fulfill its role – to the detriment of patients, research subjects and citizens. Under the old Hippocratic Code, medical practitioners were care givers of the individual as well as society at large. The code was idealistic and simplistic: some acts were encouraged and others – such as abortion or euthanasia – prohibited. But the clinical, environmental and social elements of the Hippocratic vision also provided a guide as to how health could be promoted. It was left for societies to find the balance between economic constraint and human necessity. Borrowing from Confucius, Koch warns us against “thieves of virtue” –bioethicists who promote as universal a perception of medical ethics whose end is moral action. They teach, write, advise hospitals and review boards, and generally serve as “surrogates of the general public” when ethical issues arise in practice and research. While bioethicists present the scarcity of medical services as natural, Koch argues that scarcity is the predictable result of “economic choices and political decisions made with full knowledge of the dire consequences.” Scarcity disappears when the US Congress votes to fund dialysis as a national entitlement, or when local healthboards argue for urban sanitation and preventive measures against epidemics. As political actors and social participants, bioethicists shape health policy. Their assumptions define life, health and normalcy; the care or non-care of persons depends on their perspective on the human condition. Through various case studies, Koch explains that bioethicists can – and do – regularly deny care for those with limiting cognitive, physical or sensory attributes, advocating the right to die as an individual choice rather than the right to live with dignity despite difference.